If you want to convert the characters in the image of BMP to Word document, maybe you need a program which has the ability to recognize characters in BMP image and extract text out, then save them as editable Word document. The application VeryPDF OCR to Any Converter is able to convert different kinds of image like BMP, TIFF, JPG, PNG, etc. or scanned document to editable file like Word, Excel. RTF, etc. The URL for downloading OCR to Any is supplied here. If you want to install it on your computer, just follow the setup wizard step by step and find a destination for the program. After the installation, you can launch the program at once or double click the application icon, or run the program through Start menu. There are several steps for your reference in the following contents to convert BMP to Word document. Click File—Open to open file picker window and choose the BMP image you want to convert. Use hot key Ctrl+ Oto open file picker window and choose the file you need. Click button to open file picker window. Directly drag the file you need and drop it into the program. In the toolbar on the left of the interface, you can choose to fit the current image to the preview window, view it with actual size, zoom in or out, rotate clockwise or anticlockwise. You can do the suitable operations to the input image file. On the right side of the interface of OCR to Any Converter, you can see the recognized text from BMP image after you click the button or click Command—OCR to perform OCR operation. You can set the text font style, font size, color, etc. by clicking Format—Font or clear all the text by clicking the button . Additionally, OCR to Any Converter supports to check spell mistakes after conversion when you click the button . 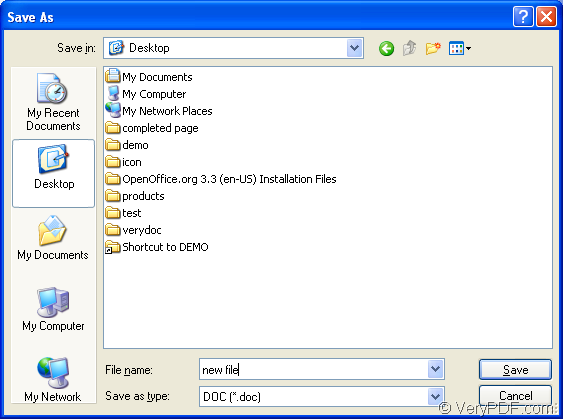 For saving BMP to Word document, please click File—Save as to open Save as dialog box which is shown in Figure 2. You need to choose the output location in Save in dropdown box, input the name in File name edit box and choose the output format as DOC (*.doc) in Save as type dropdown list. Then click Save button. So these are all operations about converting BMP to Word. For learning more usages about OCR to Any Converter, you can click here to read its user guide. If you want to purchase or get information about the program features, just go to its homepage. This entry was posted in OCR Products and tagged bmp to word, OCR technology. Bookmark the permalink.